A captivating romance that transports the reader completely! I don’t usually read romance novels. I know–I’m a woman in my thirties. Isn’t that what I’m supposed to read? At least, when I was a kid I assumed that was what moms always read. I often choose my reading material based on what I’m currently writing, and I felt I needed to step up my game when it comes to the romantic aspect of my ghostwriting projects. My book of choice is now also based on my Bookshelf Cleanout. 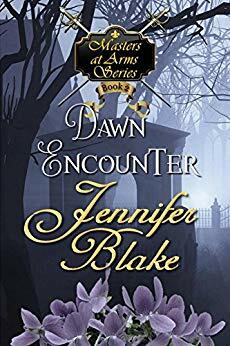 Enter Dawn Encounter by Jennifer Blake, a book that had probably been sitting on my shelf for at least a couple of years. I’d grabbed it from a library book sale, filed it away with the other numerous books I hadn’t gotten around to yet, and pretty much forgotten about it until now. From the Cover: Lisette Moisant is desperate. She had no love for the husband foisted upon her in an arranged marriage, but his death in a duel with famed fencing master Caid O’Neill has left her at the mercy of her rapacious father-in-law. As Caid is the only man in New Orleans he fears, as well as the cause of her misfortune, she requests the sword master’s protection. Guilt, fairness and reluctant attraction to the valiant widow compel Caid’s agreement. He expects the arrangement to be short-lived, but that’s before the whispering campaign begins. Lisette is accused of being a wanton who persuaded Caid to trick her husband into a duel. Caid is labeled a murderer. Public sentiment rises against them along with the demand for punishment—and who better to mete it out than the dead husband’s father? Caid and Lisette may overcome the sordid and deadly forces ranged against them—but how are they to fight the convention that forbids love between an heiress and a master at arms? What I Loved: I have to be honest here. I was expecting flat characters, simpering women, and men who were reckless jerks. But I was very pleased to find deep characters with fully-fleshed backgrounds and sensible emotional reactions. Sure, you throw in a bit of stubbornness and a few impetuous decisions to keep the main characters apart for a while, but not the unbearable stereotypes I was expecting. This is actually the second book in the series, which is something I didn’t even realize until I pulled it up on Amazon while writing this review! I think that’s impressive, considering I didn’t feel as though I was missing out on anything. What’s even more pleasing is the fact that Jennifer Blake has either done her research on New Orleans in 1840 or she has a time machine. While you might not typically think of a book as being visually stunning, Dawn Encounter definitely is. Historical fiction is a genre I’ve returned to many times over the past decade or so, and there were many instances when I felt this book fell just as equally in that category as romance. What I Didn’t Love: This is still a romance novel at heart, so it does contain some pretty typical tropes: the woman who’s determined to be independent no matter what a bad idea it is, the stubborn man who refuses to acknowledge his own feelings, and the horrific villain he must save the heroine from. But I can’t really complain about any of that, since I think this is what we’ve come to expect from a romance novel. And since it does help the plot along, it works. There were a few minor typos, but in a book of this length I would expect that. It was nothing major and didn’t detract from the story. Rating and Recommendation: If you love romance and historical fiction, then I highly recommend Dawn Encounter. You can even read it for free right now through Kindle Unlimited! It was an intriguing read that was so much more than I expected. I do believe (once I’ve made a little more progress on my Bookshelf Cleanout) that I’ll be picking up the first in the series. 4 stars!